Hanuman is a Hindu deity, who was an ardent devotee of Rama according to the Hindu legends. He is a central character in the Indian epic Ramayana and its various versions. He also finds mentions in several other texts, including Mahabharata, the various Puranas and some Jain texts. A vanara, Hanuman participated in Rama's war against the demon king Ravana. Several texts also present him as an incarnation of Lord Indra. Lord Hanuman was born as the son of Vanar raj (king) Kesari (father) and Anjani (mother). He belonged to the monkey (vanar) race and was very powerful. He is also known as Bajarang Bali. It consists of two words: Bajarang and Bali. Bajarang means with a strong iron-like body. Bali means all powerful. Other names of Lord Hanuman are Pavan-Putra (meaning son of Vayu or wind), Maruti, Kesari-nandana (son of Kesari), Anjani-putra and Anjaneya (son of Anjani). Lord Hanuman is the incarnation of Lord Shiva. Lord Shiva took birth in the form of Hanuman to serve Lord Rama and destroy Ravan, the demon king of Lanka. Lord Hanuman was very strong, intelligent and kind to all the living beings. He was a worshipper and devotee of Lord Rama. He believed in devotion and sacrifice. 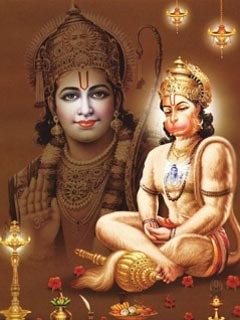 Lord Hanuman's birthday (Hanuman Jayanti) is on the full moon day (paurnima) of the Hindu lunar month of Chaitra. Hanuman, on the orders of Sugreeva, had masked himself as a Brahman to try and find out if the two mighty bowmen had really been sent by Vali, the vengeful brother of Sugreeva. However on seeing Them, all doubts were immediately wiped from the mind of Hanuman. He immediately revealed his true form. Hanuman reaches Lanka and marvels at its beauty. After he finds Sita in captivity in a garden, Hanuman reveals his identity to her, reassures her that Rama has been looking for her, and uplifts her spirits. He offers to carry her back to Rama, but she refuses his offer, saying it would be an insult to Rama as his honour is at stake. After meeting Sita, Hanuman begins to wreak havoc, gradually destroying the palaces and properties of Lanka. He kills many rakshasas, including Jambumali and Aksha Kumar. To subdue him, Ravana's son Indrajit uses the Brahmastra. Though immune to the effects of this weapon Hanuman, out of respect to Brahma, allows himself be bound. Deciding to use the opportunity to meet Ravana, and to assess the strength of Ravana's hordes, Hanuman allows the rakshasa warriors to parade him through the streets. He conveys Rama's message of warning and demands the safe return of Sita. He also informs Ravana that Rama would be willing to forgive him if he returns Sita honourably. Hanuman is a pure devotee and a prefect servant of Lord Rama. Everything that he did was only to please Lord Rama, whether it was building bridges, fighting demons or flying across the country to fetch life saving herbs. When he saw Sita in Ravan's Lanka, he not only delivered the message of Lord Rama to her but also destroyed the forest, killed many demons and burnt down half of Lanka. Hanuman never expected anything in return from Lord Rama.